Stranded in a hostile galaxy, the Enterprise is caught up in a deadly interstellar conflict! While mapping a series of gravitational anomalies, the USS Enterprise is suddenly hurled millions of light years through space, into a distant galaxy of scorched and lifeless worlds… into the middle of an endless interstellar war. The Enterprise is playing host to Federation Science Council representative Doctor Jason Crandall, an irascible bureaucrat who oversaw the creation of new sensors designed to detect gateways—portals in space, which the Enterprise had previously encountered. 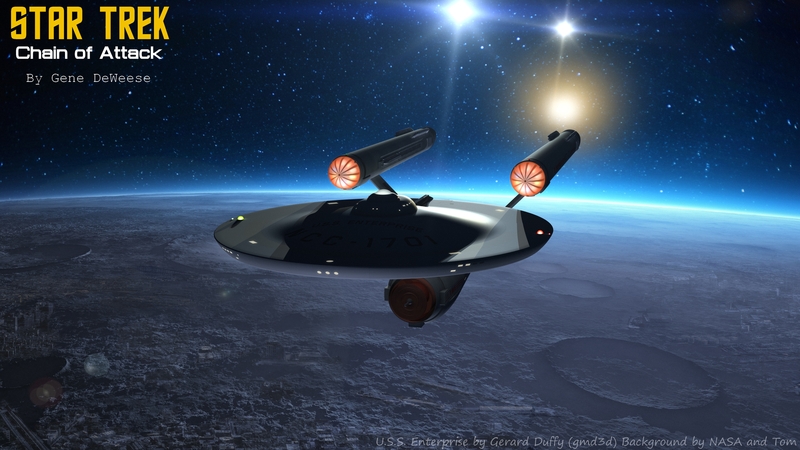 The Enterprise is investigating the gateways when it is thrown through one, and ends up in an unknown area of space with extremely dense star formations. 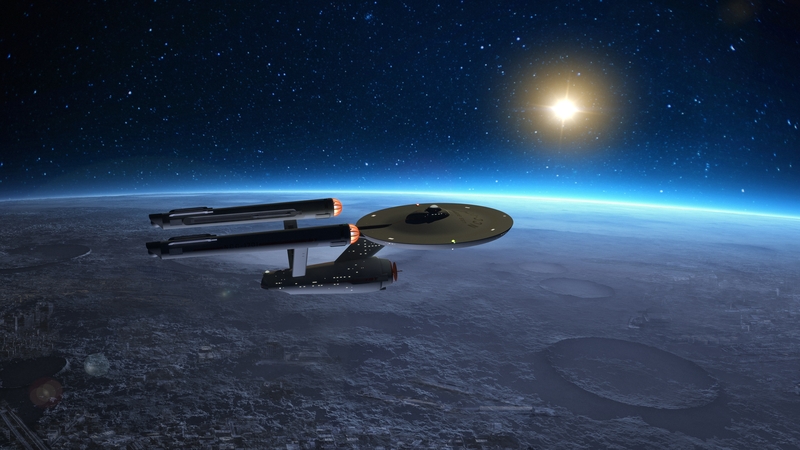 After trying unsuccessfully to return through the gateway, the Enterprise sets off to explore the nearby star systems, in hopes of finding the gateways’ creators, and thus a way home. However, all they find are planets rendered uninhabitable through bombardment with fusion bombs, phasers and other weapons. Finally they come across a spaceship, but rather than responding to their attempts at communication, it just attacks. Armed only with lasers, its attacks are ineffective, and so it tries to ram the Enterprise and then when this is ineffective, detonates its warp core. Background by NASA and manipulated by a friend (Tom).. a quick render.. but the background just set the scene for me.. 2nd and 3rd have minor lighting change.. I am not trying to be picture perfect space shot but to create and interesting image for a view to enjoy. 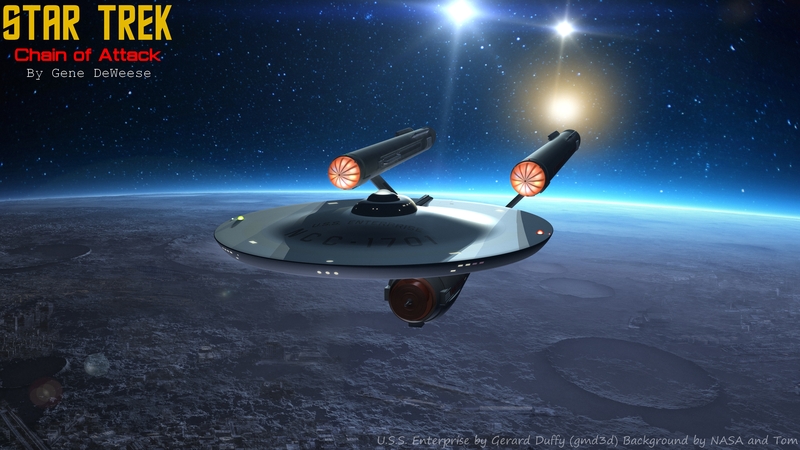 This entry was posted in Constitution class and tagged 3D models, CGI, Lightwave 3d models, Original Star Trek, Science Fiction, Scifi Art, scifi spaceships, StarTrek, taraniscgi.wordpress.com, USS ENTERPRISE NCC - 1701 by gmd3d. Bookmark the permalink.